Wisconsin was the first state in the country to emphasize the power of local history. Since 1898, because of dedicated community leaders across the state, the Wisconsin Historical Society's network of local history partners has grown to over 400 organizations and nearly 60,000 members and is written into the state's statutes as a vital responsibility of the Society. Additionally, the Society encourages all non-profit community organizations primarily concerned with the past, including publicly funded museums, to consider formal affiliation to access additional services. For more information on the benefits of affiliation, click here. 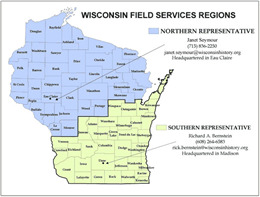 There are many ways to connect with Field Services and local history experts across the state. The Society's Local History-Field Services monthly e-newsletter provides timely updates and easy access to important information, events and resources. 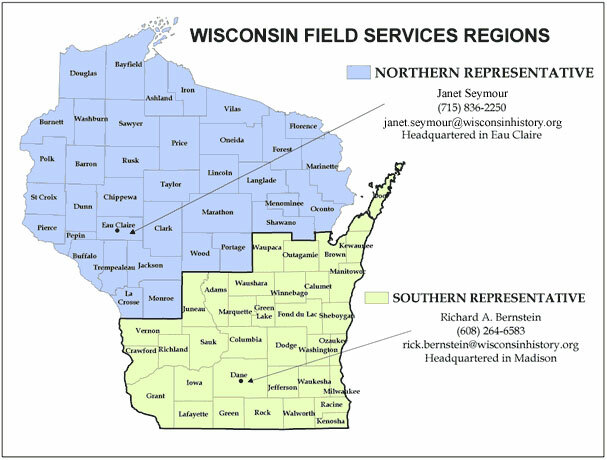 Contact fieldservices@wisconsinhistory.org to subscribe or to suggest topics for future e-newsletters. We also welcome submissions of interesting events or new exhibits happening around the state. The Local History LISTSERVE is for anyone interested in communicating with their local history colleagues throughout the state (and beyond). Members can ask questions, seek advice, post events and much more. Join by sending an email to localhistory-request@listserve.uwec.edu and typing SUBSCRIBE in the body of the email. Past messages to the Local History LISTSERVE, sorted by email thread, are archived here. Questions or problems? Please contact Janet Seymour at janet.seymour@wisconsinhistory.org.